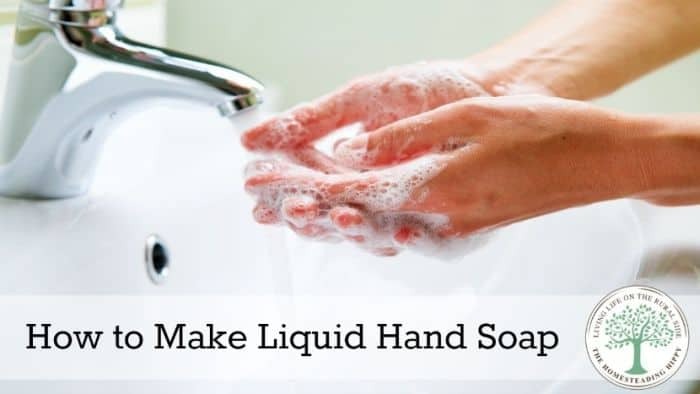 Making liquid handsoap for hand or body washing is a fairly simple task. It really only requires a few ingredients, 20 minutes of your time, and you are done. You can use any bar soap in this recipe. I like to use the homemade bar soaps that I make, and if you make homemade soap, it’s a great way to use up “scraps” as well. Begin by grating up 4 cups of soap flakes. You can do this by hand if you want, but to make it go super fast, I used the kitchen aid attachment. This recipe is pretty forgiving, as you could use anywhere from 3-5 cups of flakes, really. Place the flakes in a blender and add 2 cups boiling water. I allow it to “sit” for a few minutes, then begin to whir it up. It’ll get really foamy quickly, so you may have to whir, allow to settle, and whir again. You want all the soap flakes to be dissolved in the water. I use an old pickle jar that I got from the local deli. Carefully add 6 cups of COLD water into the soapy mixture. You want to use cold so that the bubbles “go down” and don’t pour out of the top. Stir gently. We like to use lemon, lavender, orange, peppermint or any combination of them. My personal favorite is orange and peppermint mixed together. Whatever combination you choose, you’ll need about 30 drops total. At this point, you can also add 2T. of glycerine to help keep your hands and body soft. Carefully stir the oils and glycerine into the soap and store covered. This made over a 1/2 gallon worth of liquid soap, and with my family of 5, we use it as hand and body wash. It lasts us approximately a month each batch. To use, simply place in a soap dispenser. We used recycled hand soap dispensers and old shampoo bottles that we refill. oooohhh cool! we're about out of handsoap so i think i'll be making this! what does the honey do? I have tried a similar formula and it came out like slime! Is this the correct consistency? I am just curious. you can add more water, if you’d like. mine is like slime until I add enough water.